We’ve already seen some leaked images of the rumored Galaxy A8 Plus (2018), giving us some clues as to what to expect from the handset. This A8 series, which is also said to include the Galaxy A8 (2018), is on course to replace Samsung’s A3, A5 and A7 devices for next year, despite that Google has yet to announce it. That announcement is sure to come soon, however, as we’ve now got a glimpse of the user manual and a video of the A8 Plus in action. 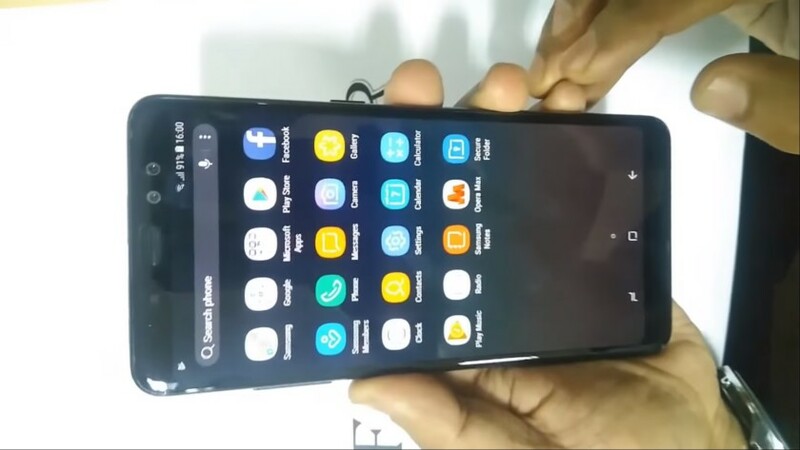 The video arrives via Slashleaks and it shows off what is believed to be a working model of the upcoming A8 Plus, as well as a potential specs list for it; check it out below (I recommend it with the volume on). The specs include a 6-inch, 18:9, Full-HD+ display (flat, rather than curved) with octa-core Exynos 7885 chip, 6 GB of RAM and 64 GB of internal storage space. In addition, the handset is expected to come with a single 16 MP rear camera sensor, an 8 MP front camera, a 3,500 mAh battery with USB Type-C connector, and an IP68 certification for dust and water resistance. A rear-mounted fingerprint scanner can also be seen in the clip above. How many of these specs will also feature in the regular Galaxy A8 we don’t know, but it’s likely that the Plus model has a larger display and bigger battery (and probably less RAM). Meanwhile, leaker Roland Quandt has gotten his hands on what is believed to be the manual for the devices, which reaffirms the core design and lack of Bixby button on the side of the device. Quandt, via WinFuture.de, also suggests that the phones will run on Android Nougat, and notes that the Plus model may not make it to Europe. As successors to the Galaxy A3, A5 and A7, the A8 and A8 Plus are expected to slot in behind the Galaxy S9 and S9 Plus in terms of power and performance, acting as a lower-cost alternative to Samsung’s main flagship series. Look out for more details on them soon, and let us know your thoughts on the handsets in the comments.